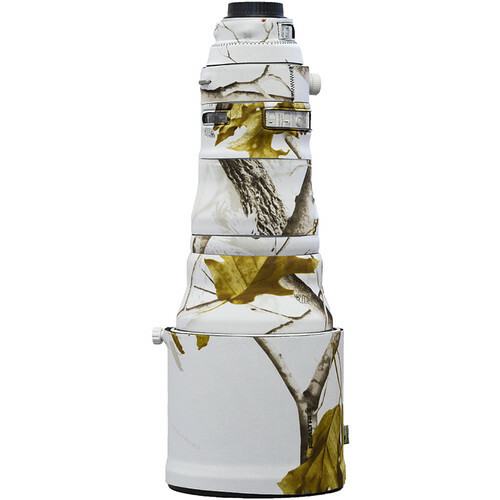 The LensCoat Lens Cover in Realtree AP Snow is a closed-cell neoprene sleeve offering protection for your Canon 400mm f/2.8 IS III Lens. It guards your valuable lens against weather, bumps, jars, and nicks. It is a useful option for sports shooters and photojournalists who are regularly subjected to less than optimal shooting and climate conditions. This version is white and is covered with a subtle pattern of leaves and branches to help camouflage the lens when shooting outdoors. Clear plastic windows allow you to view your lens functions, including the distance scale. A handy alignment notch makes it easy to mount the covered lens to your DSLR body. The LensCoat provides a thermal barrier to protect your hands from the cold surface of your lens in low temperatures. It is easy to install and remove, leaving no residue on the lens, and it is waterproof for protection in harsh conditions. The increased protection this covering offers can help preserve the resale value of your lens.